You’ve been playing guitar for a little while now. You know your basic chords, you know how to play a couple spicy licks, and maybe you know some basic theory. You’re proud of yourself for making it this far, you should be! However, you know you can still go further. That’s where this class comes in. We’ll be learning some slightly more advanced chords (plus how and when to use them), some cool techniques like fingerpicking, and how to play musically within a group setting. We’ll also be covering some fun riffs and songs to expand your guitar vocabulary. By the end of this class, you won’t just be a beginner guitarist. You won’t turn slightly red and make excuses about a vicious hangnail when the guitar comes to you around the campfire. You’ll be a solid rhythm guitarist that everybody wants to jam with! And if jamming’s not your thing, you’ll have more tools in your tool kit for your own personal enjoyment on the instrument. Erik Smistad is a Calgary-based multi-instrumentalist. While Erik is best known for his bass playing ability in the Canadian music scene, he has been playing guitar for many years as well. A professional and active song writer, arranger, session musician and performer, Erik has been teaching music full time since 2010. A few of Erik’s recent musical highlights include two UK tours in 2014 & 2015 with his progressive rock band Diatessaron and touring Spain and Portugal with the Calgary Youth Orchestra. 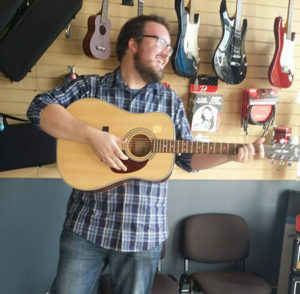 Erik is known for his ability to play any style of music, but he is especially active in the progressive rock, bluegrass, soul and alternative rock genres.